I apologize for this sacrilegious post. I have been breaking a lot of ground in terms of my physical fitness lately. Today I ran an identical race to one I ran last year, except this year I finished the 5k in nearly 8 and a half minutes less this time around. Now I am very very confident that feat can not be duplicated as I was thrilled at my sub 25 minute time, and I can not even imagine a sub 20 minute 5k at this point in time. As much as I want to say I owe my success to tea, every time I try and start down a road about how my new found physical fitness is linked to tea, I hit a near instant roadblock. I now drink far less tea than I did a year ago or more. Moreover now a lot of time I could spend drinking tea is spent working out. I am not saying this has taken away from my enjoyment of tea, in fact it could be an instance of when you get a little less exposure to something it suddenly becomes all the more precious. But could I actually owe part of my physical fitness to the fact that I am now drinking a lot less tea? Sorry I needed a picture for us to dwell on that question for a bit, because I am going to dare to say the answer is yes. But before I give my answer let me ask a few questions of you to see if I can bring you into my line of thinking before I just go into an answer. Do you ever have snacks with your tea, or feel the need to have food shortly after tea? After having a good amount of tea have you ever felt the need to be lethargic, to try and recover from the large amount of caffeine, and other substances in tea? On an otherwise beautiful day, have you ever spent over 2 hours on marathon tea sessions? To each of those my answer is a resounding yes. Now to talk about each one a little more detail. Not only do I feel the need to have food with or immediately after strong tea, especially when it is quite far from an otherwise standard meal, healthy options such as banana's, apples, or other fruits and veggies are almost never a satisfactory item to go with tea, or have after tea. Tea being a bit harsh on the stomach, when it causes you to desire food it is almost always fatty, or oily food. I can not count the number of 3-6 hour marathon afternoons of tea I have had, and this really is a double edge sword. Yes it could be worse, I could be lethargic with a 6 pack of beer, or some other highly caloric beverage and watch TV all afternoon, but that almost makes it worse, if you tell yourself for those 4 hours you are being healthy, it removes the desire to actually be even more healthy by going for a walk, or meeting up with friends to throw around a Frisbee. In fact while the tea is not bad, the best thing it is likely doing is causing repeated trips to the restroom, at least then you are moving. To circle back to the second question, even more so after many of those sessions, there is often a need to recover. It really is a lot of strong tea, and I have had enough bad experiences of going out in public after a large amount of strong tea, and once in public, things are scary, I feel like a tweaked out meth addict (hopefully I didn't look like one). Again I apologize for this post, but I am not knocking anything about how great tea is, but more attacking the fact that it is not bad for you, so clearly drinking it in excess could not be bad for you either. I also admit there was a lot more going on than just reducing my tea intake to get me to where I am today. If at anything I hope this post sparks an interesting debate about whether this is a case of too much of a good thing can actually be detrimental. Influenced by recent events with my personal life, namely my return to physical activity through running and mild weight training. One thing I have been reading about runners is it is fairly easy once at given level to just maintain at that level, but to get better though you need to train in new and more taxing ways. Thinking about where I am with tea, and I think it has somewhat shown on my blog, I have for quite a while been pretty much maintaining my tea brewing skills. So I am making a commitment to go back to practice and train with my tea brewing. People may be wondering what exactly I mean by that? I have quite a few ideas, and I will work on seeking them out. Definite things that come to mind is get back in the habit of having somewhat regular tea sessions with minimal distractions, so it can be just me and the tea. Also really digging in and looking into the effects of water on tea, not to mention stop being complacent with good cups of tea, but rather really seek to get to know how to get the absolute best out of each steep of each tea. Not to mention the photos are not completely unrelated eye-candy. 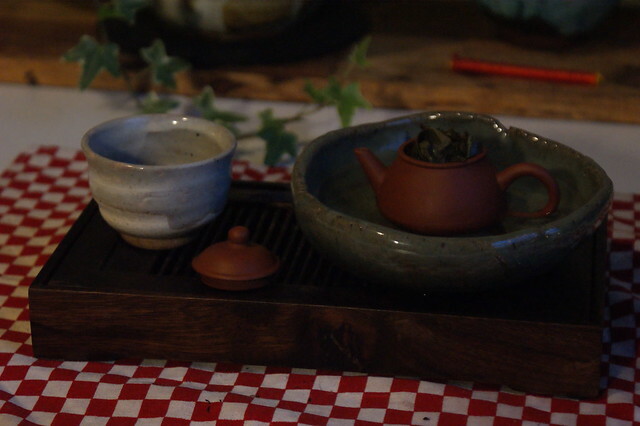 Even though for most teas I use I have a teapot that I am willing to use for them, the few times I have used a gaiwan lately, I have notice my technique has been incredibly sloppy, often dangerous. I mean its always a bad day when you pour near boiling water over your thumb while pouring. So I will also need to set out to practice brewing in a gaiwan as well. Sometimes it seems being "with skill/practice" is the number one enemy to acquiring more skill through practice. That is not to say it will not be hard, often when people hit these plateaus in fitness, weight loss, aptitude, pretty much anything including tea brewing it is because the easy ways to improve become few and far between, and the margin on improvement over effort becomes quite minimal. How do we explain how we drink tea? As a tea blog written in English, or some close facsimile, yet talking about tea in a way that so few English speakers understand. I have occasionally had to try and explain to others how I drink tea. In a certain sense, even with the cultural changes in East Asia I gather brewing tea in many concentrated steeps over the course of an hour or more is a disappearing art around the world. It is no shock that so many people give me odd looks like I am crazy when I talk about using 60ml teapots, and call them "two person teapots." I oddly think I have realized it is not something you can explain away, you honestly need to feel the people out, and if they are interested enough actually invite them over for tea. I know they say a picture is worth a thousand words, I wonder how many words an experience is worth? It takes a lot of words, and in most cases a lot of seconds or minutes of nearly blank stares back to try and convince people that what you do is actually worth while. Often if the person is somewhat receptive, once you get them to sit down to that first sip, it suddenly makes sense. So I guess this somewhat scatterbrained post, does not offer any guide on giving words to what we do, but rather, hope that if you could convince them to let you show them, you may just happen to expand some horizons. Tea is more than just a mildly flavored warm beverage (though I have somewhat often enjoyed that aspect of it as well), tea has a cultural and religious history behind it that surpasses any other beverage I can recall. So as the Zen koan says (loosely paraphrased) no matter who you are "Go in and have a cup of tea." I do not often bring up the topic of water on my blog or even really in my tea drinking. Although recent events have really made me understand it really does mater, more than I think I ever really thought. I just have never quite gotten into digging into the down and dirty chemistry of drinking water, this despite my summer and winter job throughout my Undergraduate studies was actually working for the water (and waste water) provider for the small community where my parents lived. So I oddly know a lot about what the water providers in the US do to their water, and I know certain things like that the water out of any tap from a municipal water provider is more highly regulated than what is in any bottled water from the store. Though all this knowledge has never let me dig into what makes good or bad water for tea. When I went to Lehigh University, and lived in Bethlehem, I thought tea tasted pretty darn good, even with just water from the tap, just simply filtered. Then I moved out to Kalamazoo, and for the longest time I thought "tea just doesn't taste right" I thought it had to be in my head, maybe pressure from grad school was distracting me and making me just think things were that way. Cut to three years later. I have now moved to Lansing and suddenly tea seems so much more alive again, more flavors, more body, better aroma. I changed nothing from what I was doing to treat my water in Kalamazoo, but suddenly my tea tastes so much better. Oddly it seems to be with almost every single tea, almost to the point that I feel I need to step back and relearn how to brew each and every single one of my teas, I am enjoying the challenge, and I love the great results I am getting. I may just need to look up difference in mineral results from the water providers, and start getting into the "geeking" out about water for the purpose of brewing tea. So in short, while I still do not think it is wise to go out and buy all of your water for tea, water certainly is a very important part of how your tea tastes in the end. Well I have been in my place a week, and I have really only had stuff in some semblance of an order long enough to only have tea a few times this past week. I am not sure which of these are messing with my tea drinking it could be all or just some proper subset, but between the new schedule, new location, change in tea routine (in a video I hope to do sometime soon you will see I am on a new table, and in part my entire tea routine seems to be messed up from what it was), or something I haven't quite put my finger on yet. Needless to say I have felt incredibly out of the tea zone, but at the same time I seem to be enjoying my tea sessions far far more. I do not know if it has just been some special teas ( possible given that this is part of an Aged Baozhong tasting a tea friend put together), but when I do get to have tea it almost seems to have regained a lot of its magic that had seem to be fading while I was in grad school. I think the thing that is going to disappoint me the most is tea in the office seems almost completely out of the question. Besides what I can make from the water cooler with the hot water spigot (which is woefully inadequate for a black tea, teabag but might do decently with Japanese greens). 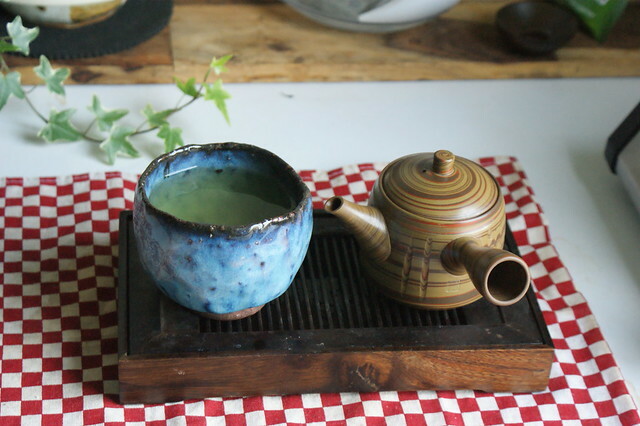 I think an adventure next week would be to take on of my Kyusu's to work and start brewing up some Sencha... wait, that needs me to have Sencha. I guess that will be put on hold for the time being. Does anyone have suggestions on how to incorporate tea into the office? Wow I am really not sure where the past few weeks went, somewhere in there I hit the Quarter of a Century Club, but was so busy getting things ready for the new job, and the move to a new place that I didn't really get to sit back and enjoy it. In fact I have a sample of The Mandarins Tearoom 1960s Shui Xian that I had hoped to crack open and enjoy on my birthday. Needless to say that did not happen. Possibly making it even more hectic is one of those days was the unbricking of the woodfire kiln for the pottery class I took this past winter/spring. There are a few I really look forward to using and getting to know better than I already do. For instance I think this rather volcanic/ earthy monster might be a great tall sided Chawan. While I am just itching to take this little hand carved guy for a run with some Sencha. For my birthday I also did purchase some teaware, which will be finding its way into photos, two of the three can be seen in this crappy cell phone picture on the patio of my new place. My place is still a bit of a construction zone, I have not fully set up where I will be displaying my teaware, ( I think that is on the agenda tonight). So my tea sessions have been kept simple, and outside when I feel it is cool enough. Good news that means the pair above has been getting a lot of testing and seasoning, the bad news is that means I am quickly running out of Sencha, and that has left all these baozhongs to try sitting and waiting their turn. So that is a bit of an update, I hope to get back to more thoughtful posts soon once life seems to settle down slightly. Happy sipping! The Sip Tip Moves to Lansing! Assuming the background check and what not passes, I will walk past this site multiple times a day, on my way in and out of where I will be working. This is because I got offered a job working in Lansing Michigan, and I hope to move up there rather soon, as they want me to start as soon as possible. All that being said posts might be fewer and farther apart for a bit until I get situated. If there are any tea drinkers that read my blog in the Lansing area, I am more than willing to get together for a few meet ups and possibly into starting a "tea club." But for the next few days I am finishing things up in Kalamazoo along with an anagama Kiln firing for a Ceramics class at the Kalamazoo Institute of Art. In fact my first shift starts at midnight and goes to 6 am. It is going to be a long night, but I hope I get some beautiful pieces out of it. This question comes up far more than I have expected, and I have myself struggled with this problem several times, but when pouring a kyusu it is not uncommon, for the filter to clog. This happens most with kyusu with ceramic filters, which true teaware addicts seem to love because the entire piece is made by the ceramic artist and there is no additional metal filter. Which ever way your mood leans, this tip for pouring can be very useful. Here I walk through my interpretation of a description given by the Teachat Moderator Chips method for pouring a kyusu to help prevent clogging. Enjoy watching me brew up two steeps, talking through and illustrating the pour. The State of my Tea State! While I sip on some very good sencha, realizing I am down to nearly 100grams of the Japanese goodness, I can not help but think that Shincha Season is in full force but due to life I am forcing myself to step to the sidelines for the most part this year. Life happens, and because it happens I am stockpiling cash as much as I possibly can while I eagerly search for employment. It is the uncertain future for employment, coupled with a few all too certain things, such as a move is inevitable, but to where remains unknown. This has me working extra hard to conserve cash, and make sure I move as little surplus stock as possible. I have already begun the process of selling/ giving away teaware I rarely use to friends in the area that enjoy tea, and I am working diligently to finish off as much tea as possible, starting with the low hanging fruit of samples but trying to work my way up to other items I have had open for awhile. Hopefully in a few weeks I have some good news, and I can catch the tail end of Shincha season. But for now it is simply enjoy the spring as we head into summer, and wish for the best in my tea journey. I hope all my readers are well, and enjoying any spring teas they decide to order. So out of the box, the leaves don't fit in! So any of us that have been around the block a few times realize we have our own preferred brewing styles for nearly every single tea we come across. Having heard good things about Da Yu Ling, I picked some up from a newly started vendor. Initial impressions were lack luster, they seemed to fall quite flat. Turns out I brewed it incredibly too light. Even though that is how I usually approach brewing Taiwanese oolongs. Through talking with the vendor, I pulled out the stops and brewed it his style, and cameras were rolling while I talked through my impressions for the first three infusions. ( I am currently on infusion 10, and I've heard it can go for far far more). So without much more ado, I present to you this video. (The title of this post will make sense when you see it). I used to really enjoy 10-14 year old puerh, back when I thought it was the definition of aged puerh. Lately I have realized even at that age it can still taste quite young, and lack the deep and wonderful qualities I have since come to associate with aged puerh. This was seen in a 2002 Haiwan HOP puerh today. Claiming to have leaves from both Yiwu and Menghai regions, even though it is quite brown in color, and brews up a reddish liquor, it is far from aged. I worked really hard at attempting to describe this tea, all I can say is I enjoyed it through and through so descriptions are somewhat meaningless in this instance. At this age the teas I feel show off what qualities they have that will persist with age, but most of the flavors that are present when young have mostly faded into the background, while the aged flavors are still in their infancy and have not really developed. You are left with something that is indescribable, but based on the feelings you can tell if it should be good or bad. Verdict on this one is good for me, but then again, I am far from a puerh expert, heck I am not even sure I qualify as more than just a puerh dabbler. Either way I filmed the first few infusions, enjoy! I have long since known that I have larger hands than most people, it fits as I am a larger person than most people. It did not occur to me though that it would be a good idea to post a blog about using teaware with larger hands, as quite a bit of the smaller, and more reasonable single person teaware items are designed for people with very small hands. A new video, in which I brew some Jade Tie Guan Yin. A very nice Tie Guan Yin which honestly didn't shine until the second infusion and later. I of course in my own fashion stumble to talk about what I am tasting and feeling about the tea while brewing the first few infusions. I feel one of the things people associate with me and tea is my teaware, and while I have spent more than I probably should have, I feel it makes the sessions better in an almost intangible way. If you are into eastern mysticism they can often try and explain that away using energies and what not of the various pieces. What I am about to say does not conflict with that it is more of just an alternate way to view that principle. I have found that when making tea, and drinking tea, that so many of our senses are occupied it is hard to give each one all the time it deserves. Yet they are all busy sending all sorts of information to our brains which it then interprets. As such the senses that are often over looked such as feel, and to a certain extent sight (on the teaware itself, not the tea), contribute far more than we imagine to the tea session. This is my explanation when people say simply having a nicer item sitting beneath the teapot or the teacup makes the tea taste better, when it has no contact with the tea itself. I recently bought the "antique" porcelain cup pictured above, and while I am not 100% sure of its provenance, it feels nice both in hand and on the lips, and looks nice with tea in it, when the tea is bright enough you can just make out the detail of the piece beneath the tea. In the first session tea did not taste quite right, I think because I was mentally worried I did not thoroughly clean it even though when I forced myself to just consider water poured in and consumed the water itself didn't taste bad. Hopefully that goes away with time, but that is another interesting thing to consider, how your mental shift towards a particular piece alters how tea tastes in it. If you are worried you are going to break the piece, worried that the piece is dirty, you just plain are not fond of the piece, etc. Then tea will likely not taste that great when you use that piece. Might actually be a weird backwards way of why some of the most rustic tea bowls in ancient times were the most prized because "they made good tea" the tea makers did not really worry about their heads if the bowl happened to be damaged. On the other side if there are things you absolutely love about the piece tea may taste better in them. Weather it is how the piece fits into your hand and is so easy to cradle, or if its as simple as the wonderful feeling of the clay foot, that while you hold the cup pondering the tea you are drinking, you graze your pinky across the foot and enjoy the feeling. Our relationship with our teaware is easily just as complicated, if not more complicated as our relationship with our tea, and then of course you need to consider their relationship with each other. New video is up on how I approach a tea that is completely new to myself. The main idea is a a more neutral leaf to water ratio ( not light, but not packed either) and then brew it similar to how you would brew most teas of that style. Its a great way to get an idea of how you should brew the tea in the future. Namely does it seem like it can really be pushed, or should it be brewed at a far lighter ratio. Enjoy!